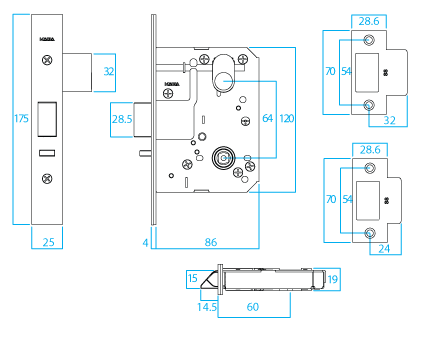 The Kaba mortise lock can be configured to almost any configuration specifiable for a door. It is a proven long lasting lock fitted within a stainless steel casing, this makes it particularly suited to our coastal environment. Can be fitted with lever furniture from just about any manufacturer, as long as it uses the industry standard spacing of 42mm for fixing screws. Cylinders are not included with this lock body, you will need to specify function so that the appropriate cams can be fitted to the 570 style cylinders. 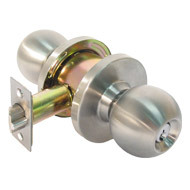 The 7000 series is a heavy duty double sprung rose lever set. It is fire rated for use in appartment buildings as the primary lock on a fire door. The 7000 will need to be fitted with a 70mm backset to comply with the fire ratings, also because of the large rose it needs the additional space to prevent a “pinch point” on closing. 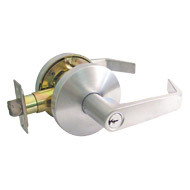 This lock is available in many different functions – from Storeroom, entrance and vestibule to double sided key locking and half sets for security fire exits. This is a fire rated knobset. It is available in all the usual functions. If fitted to a fire rated door it must be installed with a 127mm backset to comply with it’s fire certificate. Kaba E-Plex 2000 Digital Lever set. This is an amazing – cost effective – lock. We’ve fitted heaps of these to apartment buildings in Forster, the batteries (3 x AA) last over 3 years on common entry doors, over12 months when fitted to caravan park amenities blocks!! E-Plex 2000 Series Electronic Pushbutton Lock. 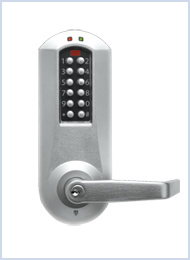 Up to 100 Users, Multiple Modes Including: PIN Access, Lockout & Passage, Simple Keypad Programming, Key Over-ride. 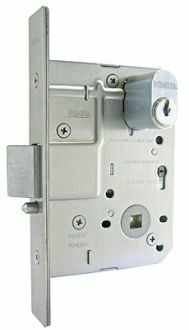 The Non-handed and field reversible design accommodates both left and right handed doors, accepting Kaba 1539 6 – Pin cylinders – Schlage C Keyway. (Supplied). Please note that the minimum door thickness for this lock is 35mm, NOT 34mm – please check your measurement. We can supply spacing plates for these however it is better to start with the correct size door. Users, Multiple Modes, Simple Keypad Programming and Key Over-ride. The E-Plex is field reversible and non-handed, accepting traditional style PD cylinders. Optional programming software allows programming, auditing and management of locks. with use of optional software.